Playful in its design and highly functional, SunMade Cheese features a charger for flashlights, lighters, radios and even cellphones powered by mere sunlight. The device was developed by YOLK, the solar company applauded for its Kickstarter project ‘Solar Paper’ in 2015 that has sold millions of dollars worth of units worldwide. This time, it seems whimsy has struck the cutting-edge solar tech firm, which decided to express its love of cheese in this new project. Continuing its sun-charged aspirations, the group has debuted quirky, cheese-plate-shaped solar panels and cheese-shaped, solar-powered accessories with a meaningful mission to boot. YOLK is eager to attract current generations to solar energy, making it easy to incorporate the technology in their daily routines. The group also hopes to improve energy infrastructure and conservation in developing nations as well as put an end to child labor, instead empowering families to send children to school. Rather than tackling these issues separately (as is common), YOLK decided to put its creativity to the test and develop the Solar Cow in conjunction with the new cheese chargers. The Solar Cow systems are much larger solar energy generators built with a portion of the revenue that YOLK receives from SunMade Cheese. The company is deploying the conductive cows in remote areas of East Africa that are burdened by poor energy infrastructure. As many as one in every five children are prevented from attending school in East Africa. Families rely on child labor to supplement the household income. Besides providing power to local schools, the Solar Cow will provide an incentive for parents to send their children to school instead of sending them off to work. 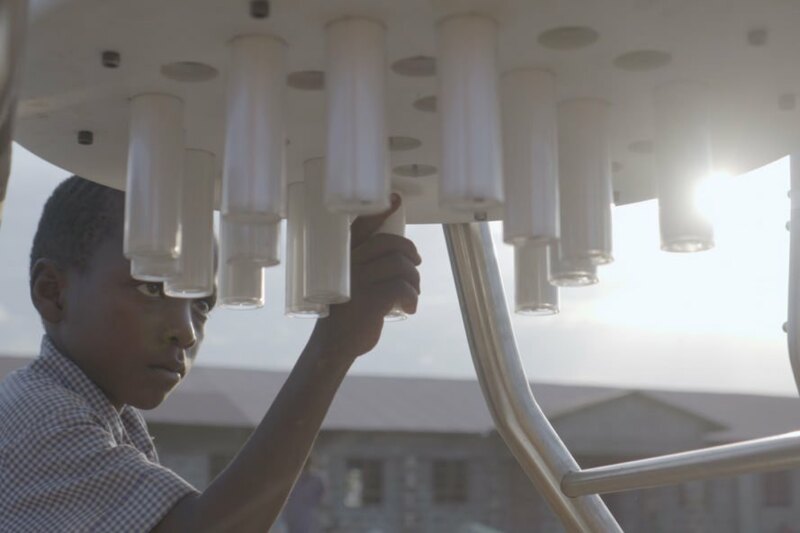 In the mornings, students are able to attach batteries to the “cow’s udders” for charging and take them home at night with a full supply of free, clean energy. “The SunMade Cheese project is more about enjoying solar power and promoting education for solar technology, but the Solar Cow is really a lifeline for people,” YOLK CEO Sen Chang explained. “They are two projects for two different perspectives, but combined in one initiative.” Families in rural areas commonly travel around four to six hours in order to reach a charging station to juice up their cellphones. The mobile phones are a necessity, because they facilitate communication to the rest of the world and a means to make payments and receive income. The cost of this process is astounding, with the average family spending approximately 10-20 percent of their total monthly earnings to simply charge their cellular devices an average of 10-12 times per month. The SunMade Cheese charger is the perfect accessory to promote an environmentally friendly lifestyle at home while assisting YOLK’s efforts to help communities abroad. Stressing creativity and efficiency, the award-winning innovators deserve to bask in the sunlight for their life-changing technological designs. No doubt, many will join them — cheese plate in hand! Playful in its design and highly functional, SunMade Cheese features a charger for flashlights, lighters, radios and even cellphones powered by mere sunlight. The device was developed by YOLK, the solar company applauded for its Kickstarter project 'Solar Paper' in 2015 that has sold millions of dollars worth of units worldwide. This time, it seems whimsy has struck the cutting-edge solar tech firm, which decided to express its love of cheese in this new project. Continuing its sun-charged aspirations, the group has debuted quirky, cheese-plate-shaped solar panels and cheese-shaped, solar-powered accessories with a meaningful mission to boot.